From the Daredevil archives: "The blind thing? It comes and goes"
One common element used a lot in superhero comics consists of the hero temporarily losing his (or her) powers. This has happened to Daredevil enough times – and may get its own post one of these days – but another thing that’s happened a few times in Daredevil is the opposite: Matt having his sight temporarily restored. Within the first year of publication, Karen Page tried to talk Matt into seeing the appropriately named eye surgeon Dr Van Eyck and even intervening on his behalf (and in doing so broke a number of unwritten social rules about not sticking your nose where it doesn’t belong). Of course, with this being Silver Age comics, this little intervention goes south when it turns out that Dr Van Eyck is held against his will by a former law school classmate of Matt and Foggy’s turned despotic ruler of a medieval little hell hole called Lichtenbad. The good doctor is killed at the end of the issue, Daredevil #9, before he gets the chance to work his surgical magic. 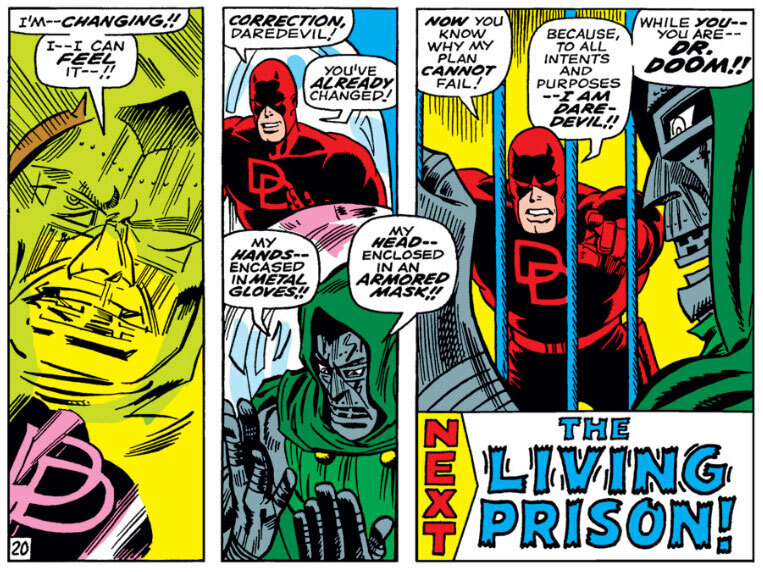 We’ve covered the odd story told in Daredevil #37-38, in which Daredevil switches bodies with Doctor Doom, before (see “DD stands for Doctor Doom” and “Because I can’t just kill him – Part 7”). The premise itself is goofy enough and it only gets worse as we realize that Doctor Doom goes through an entire issue inside Daredevil’s body not even realizing that he’s blind. Sure, Matt Murdock may not be an ordinary blind guy, but you’d think that a supposed genius like Doom would notice the world suddenly turning pitch black. Matt, meanwhile, is too busy trying to get back into his own body to even find the time to appreciate getting the chance to see again. At first he doesn’t seem to realize he’s actually seeing since the last panel of Daredevil #37 shows him reacting to wearing armor rather than reacting to having the “lights” switched on. This must have been an unintentional slip-up, because Stan Lee makes sure to address the issue first thing in Daredevil #38. The story ends with Matt demonstrating his cunning by blackmailing Doom into giving him his body back. He does so by threatening to start a war with Latveria’s neighbors… Unlike the next issue on our list, the Doctor Doom body switch is more a case of Matt experiencing sight again than it is a case of having sight restored to his own eyes. The next time Matt gets to experience the world in color is in Daredevil #106, by Steve Gerber and Don Heck. And, it’s not even his own world. You see, in Daredevil #105, Matt was transported to Titan by Moon Dragon as her prisoner. When Moon Dragon realizes that she was mistaken in unleashing three villains on San Francisco and kidnapping Daredevil, the two become allies. In Daredevil #106, Moon Dragon is injured and needs Daredevil’s help. That’s when his blindness complicates things and Moon Dragon, who is a very powerful character, restores his vision in order to get them both out of a jam. Moon Dragon doesn’t just restore Daredevil’s vision, the transformation also leads to his radar sense disappearing. Not being used to fighting without it, he soon finds himself at a disadvantage and asks Moon Dragon to restore him to the way he was. As with the Doctor Doom body switch, Matt isn’t given much time to enjoy his sight and none of these issues offers much emotional depth. That’s all about to change with the next item on our list. “The Price,” also known as Daredevil #223, has also been covered before on this site. In this case, it’s an enigmatic character called the Beyonder who gives Matt his sight back when looking to hire his legal services to take over the world(!). As usual, order is restored at the end of the issue and Matt goes back to his usual blind self. The main difference between this issue and the previous ones mentioned above is that Daredevil #223, by Denny O’Neil and David Mazzucchelli, actually takes the time to explore what Matt might want to do and experience if he were given his sight back and how this might affect him. 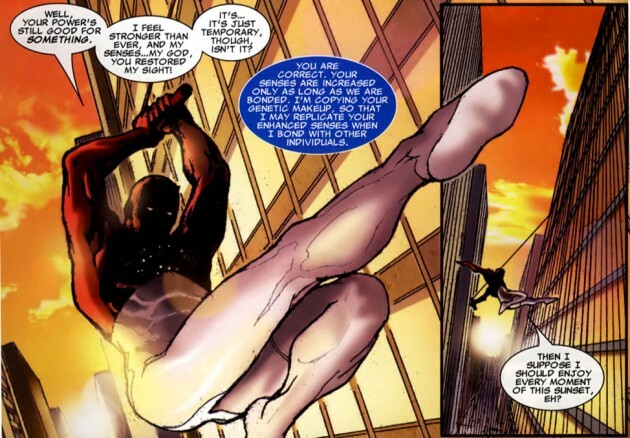 For most of Daredevil’s early history, it seemed creators had a tendency to downplay the magnitude of the loss that young Matt suffered in his fateful accident, suggesting that all his newfound powers were more than enough to tip the balance in favor of his new state of being. This is understandable. Having readers feel pity rather than awe for the main character was probably not something to strive for. 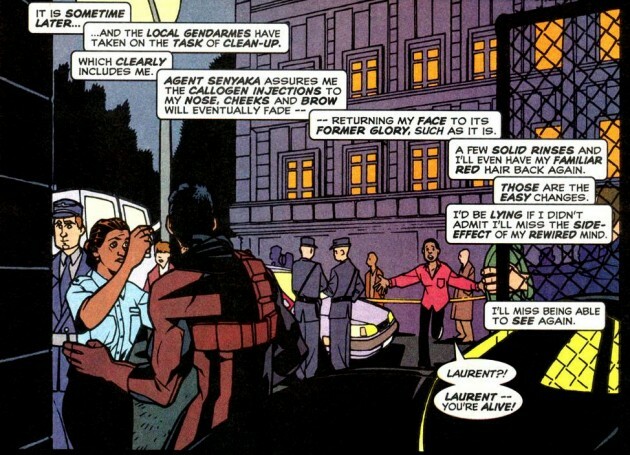 However, a modern view of the character can accommodate a more complex take on Matt Murdock’s unique way of being. Having Matt acknowledge that his loss of sight occasionally puts him in the position of wishing he could have it back doesn’t preclude his enjoying and utilizing his other sensory enhancements. The Price touches on some of the things Matt actually does miss out on and doesn’t feel the need to apologize for doing so. The next time Matt finds himself sighted once again is the first time this is achieved by the means of medical technology. On the other hand, not only did Matt not seek out this treatment, he doesn’t know he’s Matt Murdock, doesn’t look like Matt Murdock and can’t remember being either blind or a superhero named Daredevil. The four-part story Flying Blind, by Scott Lobdell and Cully Hamner, took place toward the very end of volume one, in Daredevil #376-379, and is a very strange story that sadly fails to impress on so many levels. The story begins when Matt, now with dark hair and different facial features (due to some superficial cosmetic surgery) wakes up in a hospital bed in France, where he has been sent on a top secret S.H.I.E.L.D. assignment. As it turns out, he has had his brain “rewired” and had new memories implanted. As far as he knows, he’s a French artist (yes, he apparently speaks French throughout the story), but from the very beginning he reacts to things and experiences feeling alien to him. The rewiring of his brain has also lead to his vision being restored. Naturally, this feels strange to him as well. After spending the better part of the first two issues of this story arc trying to figure out who he is, order is restored in the last issue when he suddenly remembers who he is again. As soon as his own memories return, his sight begins to fade. Apparently, the two are somehow linked. Yeah, it makes no sense to me either (also his eyes begin to get cloudy when the brain rewiring is reversed, how is this supposed to work exactly?). At least he gets a brief look at his best friend Foggy who has come all the way to Paris to pick him up before his sight is completely gone. The last item on our list is a relatively recent one-shot that ties into the 2005 series of one-shots featuring the Uni-Power (which transforms its host into Captain Universe). In the issue dedicated to Daredevil, by Jay Faerber and Juan Santacruz, Matt becomes a host for the Uni-Power and experiences a heightening of his already heightened senses as well as the restoration of his sight. 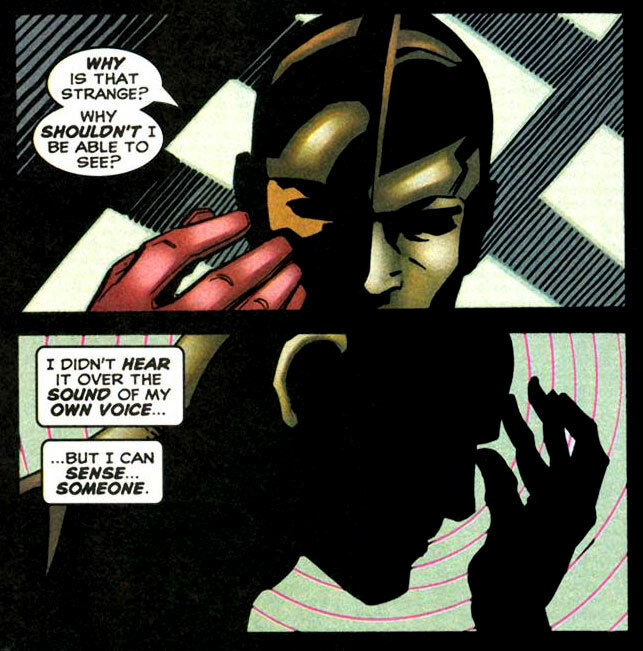 In the end, having his senses of hearing and smell heightened even further becomes a liability for Daredevil and Matt asks the Uni-Power to leave his body. 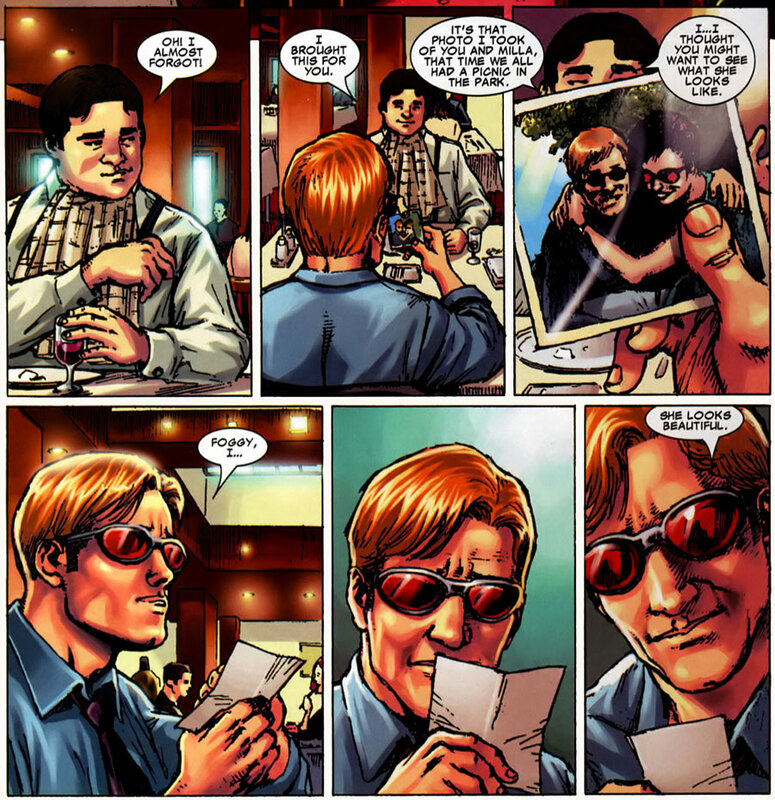 He has a hard time revealing this information to Foggy, however, who is thrilled that his best friend can now see again, and offers him to take a look at a photo of his wife Milla (why he wouldn’t take the time to seek her out in person is not revealed). Not wanting to disappoint his friend, Matt decides to play along a little longer. Well, that puts the tally at five instances of Matt getting his sight back! Not too bad for a guy who should be blind permanently. Most of these cases involve magic (or body-switching), with only the nonsensical Flying Blind story suggesting that Matt’s sight can be restored through any kind of medical procedure (though apparently only as long as he doesn’t remember that he’s blind). Issue 223 is a great issue. The less said about “Flying Blind” the better. I’ve always had issues with characters only utilizing the technological help or magic of other characters they know when its convenient for the story and completely ignoring them otherwise. The biggest for me is Oracle. There is no believable reason whatsoever for her not to go to one of the many super geniuses in the DCU or even just go up to Zatanna and have her go “riaper enips”. The absolute worst example in Matt’s history is the whole Milla madness thing. Reed Richards could not help Matt out there? Or again with the sorcery, Strange couldn’t give her a visit an take away Fear’s chemicals with a twitch of his fingers, exactly like he did for Matt in “Guardian Devil”????? What’s funny is that even now you’ll read Matt think things like “The last thing I saw was a man crossing the street” or something to that effect. No, it’s not, Matt. You saw a sunset, and Glorianna O’Breen, and the view from the Empire State Building, and yourself dressed as Dr. Doom, and a picture of Milla Donovan. One would think those memories would kind of stick with him. Wow, I didn’t know anything about that Uni Power one-shot. What was it called and from what year was it? @Robert: You’re absolutely right. Not only do the existence of characters who can do magic present a problem to their own stories (and I’m going to include Reed Richards in this category, because the vast majority of what he does can’t possibly count as science), the mere existence of these characters in a shared universe is a problem in many ways. If you want a low-powered and grounded hero (with a physical impairment no less) to exist in this universe, I guess you just have ignore the fact that he’s got friends down the block who could not only “fix” him, but many of his problems as well. However, as you point out, this problem only really becomes an issue when magic or science-fiction level science is used or ignored depending on the particular story. @Aaron K: Yes, you would think he’d remember those times, but a new reader who hadn’t read those stories would likely be confused. Personally, I look at these events as if they never really happened at all, but I’m coming to realize I have a much looser sense of continuity than many of my fellow fans. This might be something I’ll have to return to in another post. I always got the impression that Daredevil was a little proud of his blindness. I think if Reed Richards offered to cure DDs blindness he would likely decline. 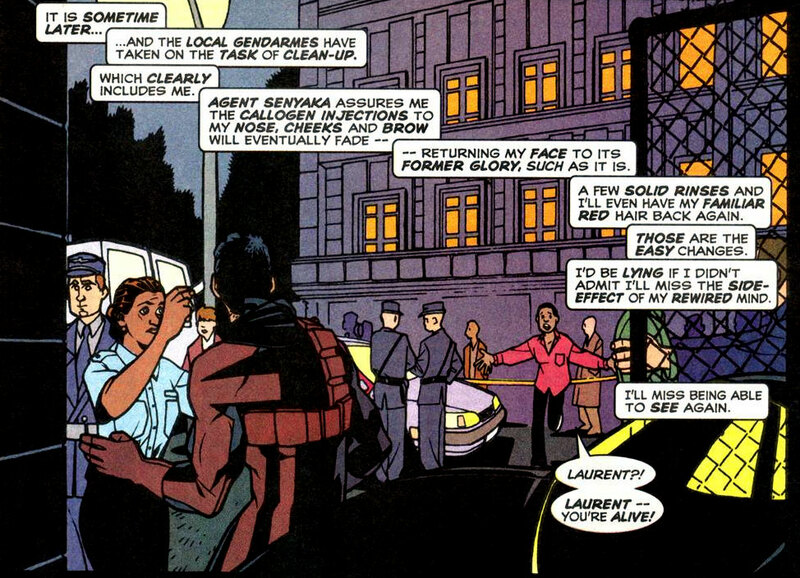 Matt Murdock has this extra something about him that most other superheroes do not (which is why we all love him). @Zach: I’d say he probably views it as a part of his identity that he’s not in any hurry to be rid of. I agree that he’d likely decline the offer and writers wouldn’t have to come up with far-fetched reasons for it (such as “it would be a distraction” or “it makes my other senses weaker”). He’s been the way he is for more than half his life and is probably perfectly fine with it. Is it an occassional inconvenience? Sure. Even with his heightened senses, you wouldn’t have to think too to come up with scenarios where his lack of normal vision would complicate things (more so out of costume than in it actually). Would he occassionally miss being able to experience the world like most people do? Again, I think an occassional pang of regret might cross his mind, but I don’t think he feels a desperate need to undergo any kind of invasive procedure to change an aspect of himself that he’s likely come to terms with a long time ago. Yeah, like I said, this piece of S.H.I.E.L.D technology makes absolutely no sense at all.